As we all know too well, it's Canada's 150th birthday this year. We knew that we wanted to do something special for it, but had no idea what it was going to be. David Lee (@PassionatePaddler) had the golden ticket idea. 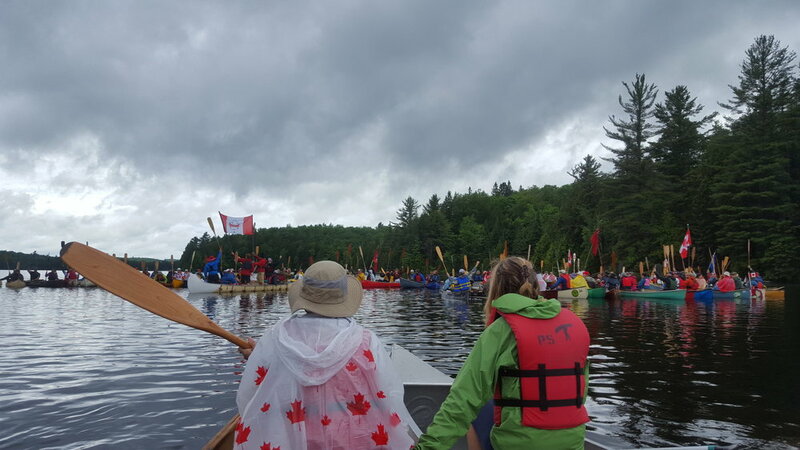 Why not get 150 canoes on Canoe Lake, for Canada's 150th birthday...I was sold before hearing another word. Once getting a phone call from David asking us to help plan the 150for150 event, we wanted nothing more than to be apart of this special day. Below is the video from the main event and at the bottom there is a video recapping some of the action on the Saturday. To acknowledge the grassroots ingenuity and craftsmanship of the First Nation’s gift to this country and people. To inform the public as to the pivotal role the canoe played in the creation of this country. To share in the passion for the sport and how it intimately connects us to this land and country. By using the power of the outdoors, they empower youth who face challenges in their lives; working with them in order to recognize their abilities to feel worthy, capable and appreciated. This wonderful organization relies on strategic partnerships and donations to deliver their “best in class” programming. The Canada 150 for 150 event is humbled and honoured to help support such an organization. 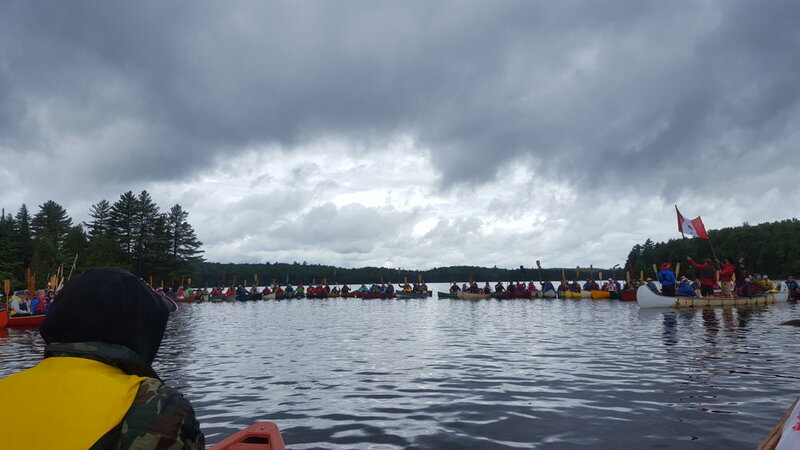 The rain started the day off testing the will, determination, and passion of the paddlers that were to gather on Canoe Lake later that afternoon. Not to my surprise, many paddlers were not even fazed by this rain as the event meant more to them than getting a little wet in the rain. 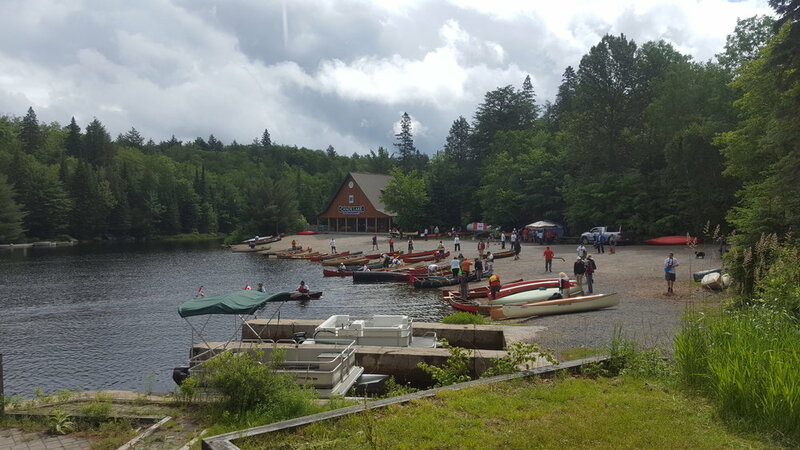 Due to the high volume of cars dropping off canoes, and the already high volume of traffic on Canoe Lake, we were forced to set the registration table up in the Smoke Lake parking lot and portaging all 150 canoes across HWY 60 to Canoe Lake. Luckily not everyone was parking in Smoke Lake so we didn't have quite 150 canoes to portage. Those on the water early had a chance to win prizes being handed out by Kevin and David off the docks. Once we got the canoes on the water it was time for the speeches. First was the Algonquin Park Superintendent David Coulas who spoke to some of the history of the park. He was followed by The Happy Camper, (Kevin Callan), who talked about the passion that burns inside all of us. After this it was time to hit the water to make a bit of history. There were markers in place by anchors to help secure boats in an attempt to get 150 canoes in a circle. After some floating and shifting here and there we finally managed to get everyone into a circle. For those who know Algonquin, you will understand that Canoe Lake is one of the most popular access points in the park. 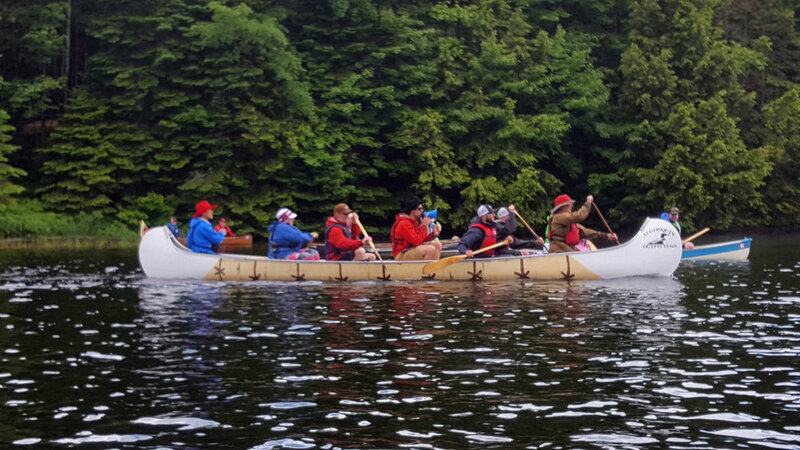 You can only imagine how quickly we were able to find 8 other canoes to join the circle. 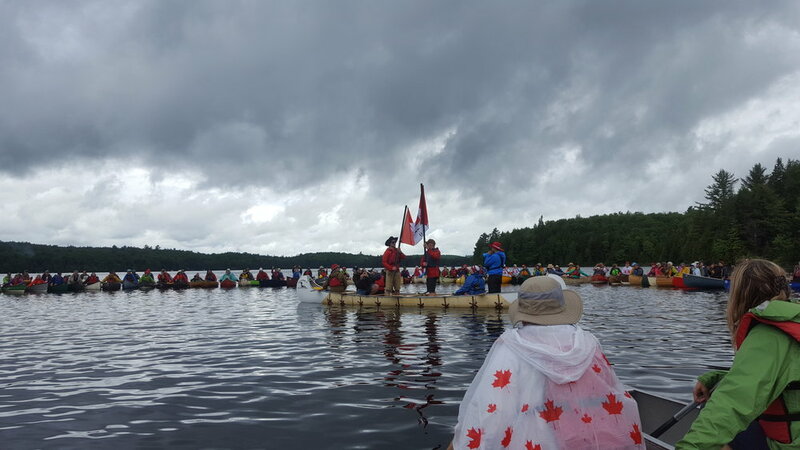 We started to think about what it would have been like coming back from a week long trip to a group of 150 canoes in a giant circle on Canoe Lake. And to top it off, we were all shouting at them, "Get over here!!!" We did another count around the circle to solidify reaching that golden 150 number to celebrate the accomplishment. 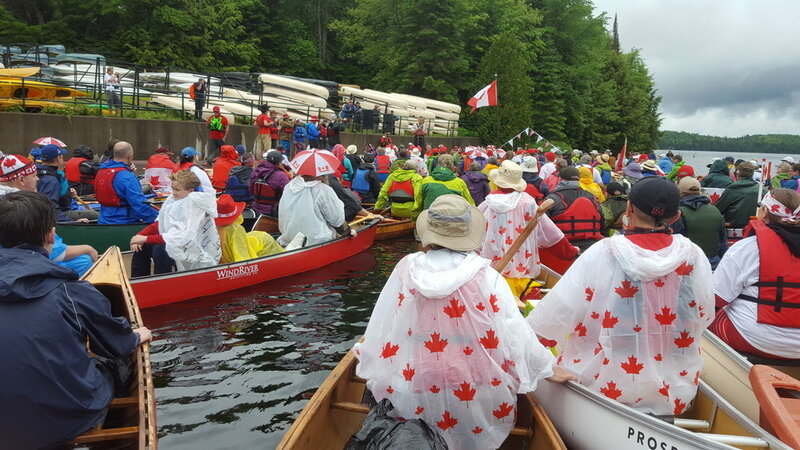 The group raised their paddles in a salut to Canada and sang the national anthem, acapella. It was truly a moving moment hearing close to 300 people singling "oh Canada" all together, in one of the most iconic places in Algonquin Park. This is an event we will never forget and we want to thank all those who helped make it possible!